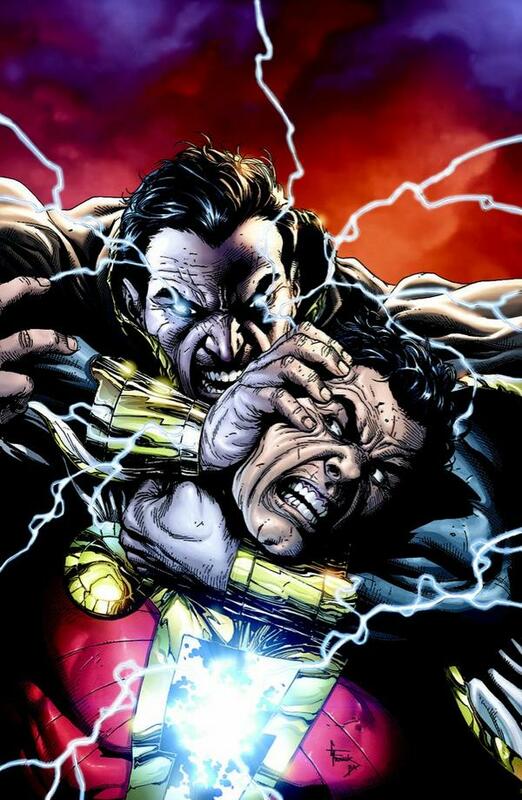 The Long National Nightmare is Over, The Rock is Black Adam in DC’s Shazam Film. This week, The Rock has finally chosen his role in the DC Universe. Hinting earlier at either being the hero Shazam or the villainous Black Adam, The Rock tweeted out the following photo that revealed his choice. Great. Now, when is this coming out? Rumor: In This Week’s Edition of “Things No One Asked For,” Wesley Snipes in talks for Blade 4. According to The New York Daily News, Snipes is in talks for not only a new Blade, but is being paid $3 million for it. I really liked the first Blade, but that was 1998. I bet Snipes would love to do a new Blade since The Expendables didn’t really cut it this summer. I would much rather a new Blade that delves into the darker realms of the Marvel Universe along with Doctor Strange. Bringing Snipes along for the ride isnt the right way to bring back the vampire hunter. The Tick is coming back, In Amazon Form! With Amazon trying to gain ground against other services like Hulu and Netflix, rumor has it that Amazon is pushing to try and revive the superhero cult classic, The Tick. Show creator Ben Edlund tweeted this week that not only is Amazon looking to revive The Tick, but doing so “With Vigor”. The Tick began as a newsletter mascot for Boston’s New England Comics back in 1986. The character’s popularity blossomed the spoof superhero into an animated series in 1994, and lastly as a short-lived live-action television show which originally aired on Fox. It ran for only nine episode back in 2002, but suffered from a bad time slot and was rarely promoted by the network. Something that a fair amount of shows around that time had problems with. Along with Edlund coming back, word is that Patrick Warburton, star of the 2002 The Tick series, is also on board for a return. Really, all I can say is spoon! Greatest American Hero Reboot coming from 21 Jump Street Directors. A reboot of the cult classic has found a home at Fox. Originally airing for three seasons in 1981 on ABC, the new Greatest American Hero will be handled by Phil Lord and Chris Miller, the creative team behind the remake of 21 Jump Street. This isn’t the first time that the team of Lord and Miller have worked for Fox. They were also behind the creation of Fox’s comedy hit, Brooklyn Nine-Nine. The new version will see inter-city teacher Issac, who discovers the suit, but has to learn the suit’s powers through trial and error after losing the suit’s instructions. I hope they keep the original theme. Last weekend in Seattle was one of the biggest game conventions of the year, The Penny Arcade Expo. All the biggest publishers and developers showed off there biggest games for the upcoming year and here are some announcements that came from the show floor. Nintendo has announced a new version of the popular handheld Nintendo 3DS. It will be called New Nintendo 3DS. Not the best name, not sure why they just didn’t go with Super Nintendo 3DS. The new update will feature a bigger screen, colored face buttons, a new second stick, faster download speeds, a better browser, extra shoulder buttons, and Amiibo functionality. Currently only slated for a Japanese release on October 11th for 16,000 to 18,000 yen, I wouldn’t be surprised to see an American release soon after. Shulk from Xenoblade Chronicles announced for Super Smash Bros.
That Smash Bros. character leak is looking more real with each passing day. Team Meat announces Super Meat Boy Endless Runner Style Game in the vein of Bit. Trip Runner. Also, the currently in production, Mew-Genics, is on hold until the completion of Meat Boy. Xbox 360 Game State of Decay is coming to Xbox One with 1080P support. Volition announces Standalone Saints Row Expansion, Gat out of Hell for current and last gen consoles. Also, Saints Row 4 along with all DLC is coming to Xbox One and PS4 for $30 in Early January. Battleblock Thater and Castle Crasher Developers, Behemoth, shows off Strategy RPG Tentatively Titled, Game 4. Harmonix Announces New Music-Based Bullet Hell Shooter game, A City Sleeps. Psychological Romance Adventure Game Alone With You coming to PS4 and PS Vita. DC Announces Return of Secret Six with Writer Gail Simone. As reported by The L.A. Times, DC Comics will release Secret Six this December with returning series writer Gail Simone. “It’s so fun to write these characters that are really poor role models,” Simone told Hero Complex in a phone interview. Setting the story up as a Twin Peaks-like mystery, knowledge of the book is mostly unknown at this point, except the return of two former members, Catman and Black Alice. Both will be making there début in DC’s New 52 Universe. Artist Ken Lashley will be the ongoing artist, but character redesigns will be handed by Dale Eaglesham, the artist that handed the character redesigns during 2005’s Villains United, the book that introduced the Secret Six. Simone has offered high praise in regard to wanting to work with Lashley for awhile. “He draws the fiercest heroes, the creepiest villains, and that whole spectrum from Metropolis sunshine to Gotham’s deepest shadow,” she wrote in an email Wednesday, after DC confirmed he would work on the title. “I can’t wait to see what he does with comics’ dirtiest wild bunch!” said Simone. Simone’s run on Secret Six was magnificent. I loved that Simone took these supposed villains and made them a team that shouldn’t have worked. They fought, but they were family and because of it. It’s one of the best team books of all time. It’s been three years and I hope that Simone can recapture the magic of her original run because comics would be better for it.